Running Office on your Windows 10 iPad works well, if you realize that running Office on a touch-first device is quite different from running it on a desktop or laptop. Microsoft’s done a more than credible job translating the big ol’ Office you’ve all known and loved for decades into a svelte and quick thing that does justice to the touch approach. You may have heard that Microsoft released Office on the iPad even before it released Office on Windows tablets. It’s true — and remarkable. Office for iPad and Office for Windows/Mac share a few idiosyncrasies, but by and large they’re completely different programs. Although you can pick up a document in one and use it in the other — going both ways — and some of the concepts carry across, there’s a big gulf between the desktop/laptop versions of Office and the touch-first transmogrification on the iPad. If you’ve ever tried to tap your way through the desktop version of Office on a mouseless machine, Office for iPad will blow you away. The interface runs rings around the desktop Office you’ve known for decades, for touch-first situations. But if you’re looking for a specific feature that’s in desktop Office, you may well come up empty-handed — in the move from desktop to iPad and other touch devices, wide swathes of features were cut. The free version of Office for iPad is slightly different from the paid version of Office for iPad. For most people, the difference isn’t enough to sneeze at. If you want a detailed list of the differences between the free and paid (Premium) versions of Office for iPad, look at the official list and scroll down to the list marked Extra Features on Your iPad and iPhone with Office 365 or (if you have an Android device) Extra Features on Your Android Tablet and Phone with Office 365. Most people will find the differences underwhelming. 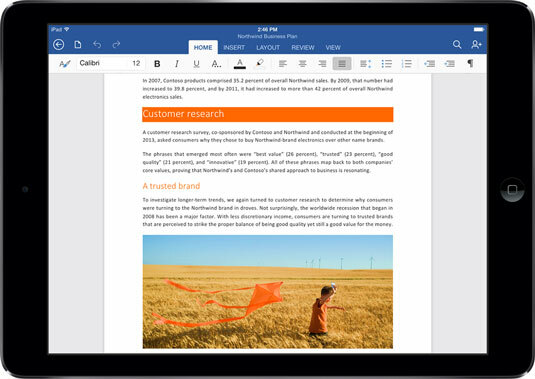 Here’s what you need to know about getting Office for iPad. Fire up your iPad, hop over to the App Store, search for Office, and install Word, PowerPoint, and Excel. That gives you the free version. When you first start Word, Excel, or PowerPoint for iPad, you’re asked to provide either a Microsoft account or an Office 365 account (see the following figure). If you (or your organization) haven’t yet paid for an Office 365 subscription, or if you’d rather save that Office 365 license for a different device, you should ask yourself if you really need to pay for your copy of Office for iPad. Surprisingly, the paid Office 365 account gives you only a few more features. 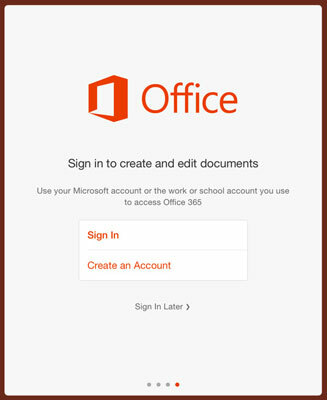 Office for iPad wants a Microsoft account or an Office 365 account. Note that you get one Office for iPad license when you buy Office 365 Personal, five when you buy Office 365 Home or Office 365 Business or Business Premium, but you don’t get any licenses with Office 365 Home & Student or with Office 365 Business Essentials. After you have Office for iPad working, there’s a whole world of new but familiar features — fonts, page layouts, picture manipulation. The commands are arranged a little different from what you may know on the desktop side of the fence, but most of what you use is right there, lurking somewhere (see the following figure). For example, tracked changes work just fine. Word for iPad, with all sorts of familiar capabilities, including tracked changes.